I’m a big admirer of the the techy tea party movement pioneered by Sharon Tynan for Age UK London and then developed nationally by EE and Age UK. There’s now a National Techy Tea Party Day – or you can organise your own, as I reported last year from Primrose Hill. My friend John Popham has extended the idea to a techy Christmas party. The original format is simple – companies invite older people to their premises, rather than send staff volunteers out to do good things in the community. Or hopefully both. 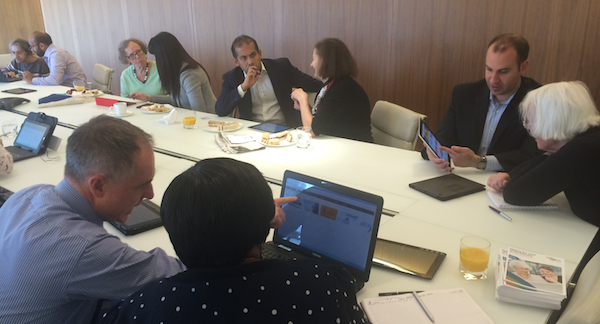 Then there’s tea, cakes and some face-to-face – or shoulder-to-shoulder – learning about technology. These days that’s as likely to be smartphones and tablets as laptops, with the option to bring your own or use devices provide by the organisations. I think that the informal, conversational approach of techy tea parties, where people decide what they want to learn about, is an important complement to more formal training courses – and useful to people who already have some tech experience and want to explore further. If you bring your own device, then what works at the tea party works at home too. Not always the case with courses. Social media surgeries are another great model. So when I spotted two local events in the City of London Healthwatch newsletter I asked Sharon if I could come along … provided I promised to blog a piece or otherwise help out. I’ve lived in the City for 15 years – after various moves around the Midlands, Surrey, Reading, west London and Brighton – and it’s my favourite. There’s more than 7000 residents among the 300,000 workers, and lots to do, not least at the Barbican Arts Centre which is cheaper and better than many West End venues. Cheapside is now a lively High Street, and more pleasant than most. Although bankers, lawyers and residents co-exist fairly happily we don’t usually get invited to lunch … so I was particularly tempted by the offer of a Techy Lunch at global law firm K&L Gates. They have offices in One New Change, the big shopping and restaurant complex across the road from St Pauls. Sharon had introduced me to Alison Westlake, who organised the event for the City’s Age Concern . In the video that I shot at the lunch, Alison describes how useful the events are for residents, and Fez Abbas, from K&L Gates, puts the event into the context of the company’s wider commitment to service in the community, explained here. The sandwiches and cakes were excellent, K&L Gates staff exceptionally helpful, and residents contributed their own insights about the online world. Conversations at the event, about the difficulty of finding information even when fairly confident online, gave me an idea for some possible follow through. While the City of London Corporation has good general listing of services, attractions and events, they can’t cover the whole range of smaller groups and informal activities in and around the City. In addition, there’s scope for bodies serving older people – and anyone else – to improve their information and communication. Age UK London is running a Tell Me campaign on this. I’ve been developing ideas with colleagues for a Maps, Apps and Storytelling initiative to provide people with better pathways to their interests, develop stronger networks in a community, tell stories, and help develop conversations online and off. One aim would be to support initiatives to address loneliness and social isolation … which can be an issue even at the heart of the City. I’ve had some great discussions recently about developing a project in East London, using a mix of radio, other technology and events, and possibly linking up with the City for support. I’m now thinking that I should make a start nearer to home, and see whether a group of tech-savvy City residents – and maybe corporate volunteers – would explore how best to use tech with other methods to help connect people with local opportunities, services and sociability. I don’t think we necessarily need to develop a substantial new local web site or forum. A recent report published by NESTA and Cardiff University’s Centre for Community Journalism shows how difficult it is for the first generation of hyperlocal community sites to sustain their activity – not least because there are now so many source of information, together with DIY personal publishing via Facebook and Twitter. It’s as difficult to evolve hyperlocal digital business models as it is to keep local papers going. The big challenge, in my mind, is how to make the most of existing local communications and resources, with an emphasis on making sense for different interests, connecting conversations, and helping people contribute. 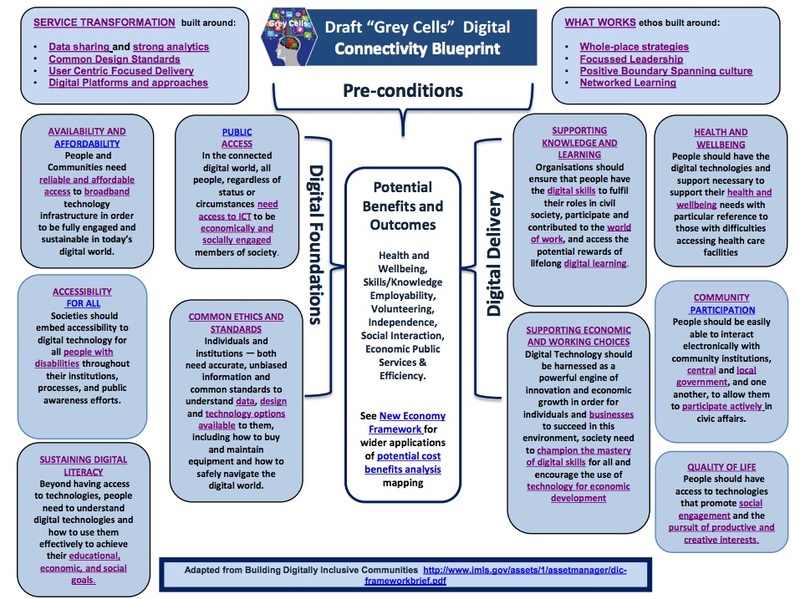 Adopt the principles of Asset Based Community Development in the digital world … join up rather than start up. I’ll see if I can gather any support for the idea and report back. If we can’t invent something appropriate both for the City and elsewhere, combining resident and business skills, where can we? I’ll also be looking at what’s happening elsewhere. London can be complacent. Over the past few months I’ve been blogging at mediablends.com about my exploration, with Drew Mackie, into Living Well in the Digital Age, and been rather remiss in failing to provide an update since April – so here goes. In addition, the Big Lottery Fund, which supports the Centre with a £50 million endowment, is promising to explore how digital technology could play a bigger part in the community projects that it supports. More here. We ran a workshop in July to explore how best to take our ideas forward – report here – and then things rather died during the holidays. My next step is to check in with the new digital manager at the Centre for Ageing Better, when appointed next month, and see if we can link the exploration to the Centre’s digital initiative. Update summary: Over the past month we’ve run a workshop with the Department for Communities and Local Government; developed some ideas on why digital innovation is important on various fronts; engaged with the new Centre for Ageing Better; and authored a paper on networks and network mapping. In addition I’ve taken a few steps to re-organise content, including moving blogging about Living Well across to mediablends.com and setting up a wiki. Here’s summaries of recent posts on mediablends.com archived on a new wiki. Practical ideas for making sense of technology in Care, Living Well and #AgeingBetter Local councils and partnerships will this year be faced with the growing challenge of deciding what technology solutions to develop and promote for care, health and wellbeing in their community. We’ve put together some ideas on how to approach those issues, from our exploration into Living Well in the Digital Age. The paper is here. How do we shift from yet more research and reports to innovation in #AgeingBetter? Ideas please If we believe yet more old-style research and reports isn’t the way to promote greater innovation for living well in the digital age, how can we help organisations like the Centre for Ageing Better make the change? Ideas please 23/04/2015. Here’s how I’m re-organising content following earlier blogging on this site, and use of a Google site. First, blogging is now over at mediablends.com, on a Withknown site. The advantage of that is the site allows you to automatically post the title and a link to Twitter and other social media. Any responding tweets then curate under the post, which makes it easy to track conversations. It also uses webhooks to post to the team space we have on Slack.com. Second, my son Dan set up a Git-powered wiki on mediablends.org.uk where I’m gathering content from earlier sites, archiving the blog posts, and adding longer papers with Drew Mackie. Third, I’ve followed Dan’s advice in using Markdown both on the blog and wiki: that’s basically text files with simple markup like # •  () that an editor turns into html. It’s quick to write and easy to transfer between sites. I’ll update occasionally here, but do please take a look at mediablends.com and content on the wiki. As you’ll read in the summary below, the exploration, which I’ve been leading with Drew Mackie, was triggered by the Big Lottery Fund’s £82 million Ageing Better programme, and particularly the initial lack of ways to exchange experience and introduce digital innovation. We’ve been working with the Digital Inclusion Group of Age Action Alliance. (DIG). As I reported the other day, BIG has now opened its online community for testing, and there is a space for Ageing Better. We should hear more about local plans – and innovative developments – in a couple of months when the partnerships know how far their business plans have been approved, and receive confirmation of funding. Meanwhile the main conclusion in our report is that we should switch our focus from programmes, to exploring in more detail what digital technology means to the individual – in different situations, with different interests, needs, capabilities and support. The scope for digital healthcare is likely to be particularly important, as Tony Watts has highlighted. We’ll be playing through what that means in a workshop next month with DIG, and I’ll be posting more here about the approach we’ll be taking, based on the games and simulations reported here. The exploration into how to use technology for Ageing Better started in the autumn of 2014 with the idea that it should be possible to map organisations and resources in the field to enable more sharing of experience, reduce constant re-invention, and promote cooperation. The Big Lottery Fund hadn‘t done that centrally in 2014 for their five-year £82 million Ageing Better programme – could we demonstrate an alternative bottom-up approach, building on past work in the field? This report summarises the journey that is documented more fully on our site – and comes to the conclusion that we should switch our focus from technology in Ageing Better, at a policy and programme level, to technology for Living Well as individuals, together with what is needed to support that in local communities and centrally. The challenge is that every individual has different interests and preferences – so one size of support doesn’t fit all. The rationale was that we needed to know what we were looking for in mapping, before starting a big trawl. It‘s been a voluntary effort so far, and we needed to focus. We decided that if we could generate ideas on tech for Ageing Better, and cluster those, we could then look at which organisations might share experience and perhaps work together. What emerged from that – and our other explorations – was that the idea of promoting cooperation among organisations in the field, to achieve greater benefits and innovation, was somewhat naive. As other commentators confirmed, co-operation is difficult because organisations are competing with each other for funding; innovation is difficult because few organisations actually use social technology. The major challenge is culture. We could map ideas, organisations, and resources – but the likelihood of making any difference is low. At this stage – in February 2015 – we are considering a change of focus towards the individual. It seems likely that the greatest progress will be made by exploring how older people – and those who help – can choose and use technology for personal well-being. So at this stage we are considering reframing the exploration towards Living Well with Technology – what can be done to enable and support the individual. Although our focus is on older people, the lessons will be more widely applicable. There‘s lots of opportunities for innovation and use of tech for ageing better – but it is difficult to move forward on a broad front because of cultural and other barriers in organisations in the ageing and inclusion industries. There‘s great work being done – but also much re-inventing of the wheel. Competition for funding inhibits cooperation. Lack of familiarity with technologies limits development taking account of the consumer adoption of mobile tech. As this blog post summarised, the energy is around people apps and connectors – not organisations. We now need to experiment at several different levels: the individual, the surrounding social network and support system, and in programmes. Overall, the issue is Living Well with Technology – rather than Bridging the Digital Divide. Explore the scope for work with partnerships in the Ageing Better programme, or with towns and cities aiming to create Age Friendly places. You’ll be able to network with other people, learn about previous projects, get expert advice and share your knowledge. There are online spaces for countries, programmes, projects and groups. I’ve been particularly interested – as discussed here – in a platform for knowledge exchange on BIG’s Ageing Better programme, and that’s now available here. I haven’t spotted any formal announcement of the online community , although BIG is advertising the post of Digital Community Manager. I gather that’s a replacement, rather than new job, and the site is currently being used for some live testing. I’m interested in the development strategy, because the usual wisdom – see Feverbee’s excellent resource – is that this should be a carefully managed process from the outset. I hope there may be a blog post explaining the process, and inviting enthusiasts to give feedback and ideas. I think one of the challenges/opportunities will be to engage people who currently use the various BIG twitter accounts and tag streams, and connect with BIG blogging, which tells some great stories. There is some blogging here. My hunch is that success will also depend on internal engagement, and whether BIG staff are able/encouraged to join in. That would make it an attractive way to get guidance on funding, and tap into the enormous knowledge resources that BIG holds about projects. I found some encouraging posts from funding managers. Either way Digital Community Manager is going to be an interesting job. I’ll hold off further comment until I’ve had a look around, and take the positive view that it is really good news BIG has created the space, and is hopefully open to input on how it develops. Hope to see others in there too. Update: I’ve developed the Innovation in Age Better site to include an ideas platform, where you can add ideas, comment and/or vote. I hope to gather more from today’s symposium – see below. I’ve got to the point in my exploration of innovation in Ageing Better when it feels like to good time to pull together some talking points, and then use any discussion to refocus on the challenges, ideas for action, and some mapping of who might do what. I never quite understand where I’ve got to until I’ve written it down, and I’ve been invited to a symposium in early January on ‘Transforming not excluding – the impact of information technology and innovation on later life’ organised by Age UKs in the South East and SEEFA, the South East England Forum on Ageing. The symposium is being hosted by Lord Filkin, who is chair of the Big Lottery Fund’s Centre for Ageing Better, so I need a script in case there’s a chance to contribute. Or just pitch online, of course. All my Ageing Better posts here, including quite a bit on the challenges of BIG’s Ageing Better programme. I’ll return to these provocations – and the follow-through process – in later posts, and pull together some of the references I have that back them up. Meanwhile, what do you think? There’s an open document here, for comments or additions. 1. There isn’t an opt-out from technology – but you can choose how much you participate. The world is being changed by the Internet and digital technology: work, entertainment, public services, learning, social connections are all being transformed. What’s important is help people choose what works for them. 2. Government is concerned that many older people are not online – but there are limits to what government can do. Government wants to save money by moving information and transactions online. Many older people don’t see the point, and no-one can force them. People need to see what’s useful to them personally – not to government. 3. Everyone needs Internet access … but beyond that, no one size fits all. Unless you work in an office, you will want devices and apps that meet your needs, not those of an organisation. 4. Computer courses and basic skills training don’t meet the needs of many older people. These days people are just as likely to learn by using a tablet, with help from a friend, volunteer, or younger member of their family. 5. Simpler interfaces are needed for computers and mobile devices – not just more functions. The wider range of tools can be provided at a second level, where they are less bewildering to new users. 6. Relatively few organisations in the ageing field are actively engaged in the online world or using collaborative tools. That’s a problem in developing policy or practice – because you can’t really understand the way that social media and the online economy and culture are changing the world, if you are only using office systems. Nor can you share experience readily. 7. Digital social innovations in services are not scaling. There are lots of innovative projects, but people on the front line may not have the tech skills, support or incentive to adopt them. Or they may not know about them. 8. There is a raft of research, but little knowledge-sharing of that and day-to-day practice. Organisations are competing for funding, and this works against a cooperative culture. 9. The energy for change lies with apps, connectors and storytellers: those developing useful personal devices and apps; those trying to connect ideas, innovators and investors; and those telling stories about what’s working in terms everyone can understand. Generating ideas for action around key issues: e.g. access, support, personalisation, simpler devices. Mapping who is doing what, and who might collaborate if better connections were made. Focusing on small-scale innovations that might scale. Starting from austerity zero: what might we do if existing programme were not around, and funding were very limited. I’ll come back to those ideas in later posts. Thanks to members of the Action Action Alliance Digital Inclusion Group for their encouragement and input. I should emphasise they bear no responsibility for the provocations at this stage, although I’ll be checking out what they think.